Is There a Cure for Maltese Eye Stain? Maltese eye stain or "dog tear staining" is probably the most talked about topic for Maltese owners. Although my Maltese dog Marley doesn't suffer too much from it, many of her friends at our local Maltese Meetup group do. I've read countless articles about this common Maltese problem and wanted to find a way to help other Maltese owners. I decided to condense all of this valuable information on Maltese dogs into an easy-to-read format. I found out that there are many ways to prevent dog eye stains once you know the exact source of the problem. Finding the cause of your Maltese tear stains is the key to preventing or even curing dog eye stain. What dog tear stain remover worked for your Maltese dog? Tell us about it. Health - tear staining can become a problem due to excess tearing, blocked tear ducts, genetics, or simply cutting teeth. Environment - many dog eye stains are due to the environment causing irritation or allergies. 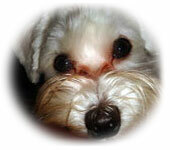 Food & Water - eye stain can even be a result of the type of food or water you give your Maltese. Genetics - heredity plays a large role in the amount of tear staining your Maltese dog has. Natural Remedies - try out a few of these remedies to naturally rid your Maltese of tear stains. Topical Treatments - there are many mixtures you can create and apply around your dog's eyes to reduce eye stain. Antibiotics - although a controversial subject, sometimes antibiotics is the only way to get rid of chronic tear staining. Other Medications - there are even a few over-the-counter medications you can use to treat dog eye stains. Do you know of any other solutions to Maltese eye stain? What has worked for your Maltese? Share your eye stain solutions and experiences with your fellow Maltese Maniacs! Your solution will appear on a Web page exactly the way you enter it here. You can wrap a word in square brackets to make it appear bold. For example [my story] would show as my story on the Web page containing your solution.